Introducing the first in a delightful new series of prints by Jean Monti. 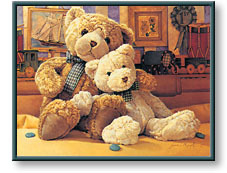 Inspired by her son's teddy bears, The Warm and Fuzzy Series was named after Warm and Fuzzy, the two bears depicted. The number within the image designates this as the first print in the series. Each print in the series will have a number somewhere within the design to designate its order within the series. Be sure to look for these numbers! Warm and Fuzzy is available unframed or tastefully framed with conservation framing that compliments any decor. Each print comes with a reproduction of a pencil sketch by Jean Monti, plus a portion of the rhyming adventures of Warm and Fuzzy, suitable for framing. Framed Size: 16 5/8" x 17"
This print comes in a maple frame with a beige top mat and a gold bottom mat. Warm and Fuzzy copyright © 1999 by Jean Monti is prohibited from being copied.